Each year, the Nature Artists’ Guild presents a program featuring three of our most talented members and their artwork. This year, artists Bob Sunyog, Gail Diedrichsen, and Lindsay Sandbothe will be sharing their knowledge of techniques, materials, tips and inspirations with us. An added twist for 2015 is that all three artists will be working with wood, each in their unique way. Bob Sunyog has been a member of the Nature Artists’ Guild for many years and as an advertising firm retiree, as well as fine artist, has worked in many media. 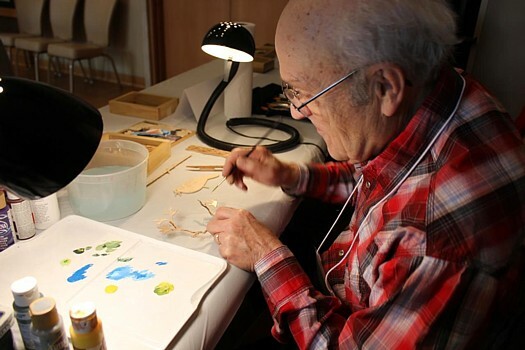 For this presentation, Bob will be narrowing his focus to the creation of his wonderful small three-dimensional dioramas made of wood, featuring various aspects of nature. Gail Diedrichsen, our current Nature Artists’ Guild president, is a retired art teacher (as well as children’s book illustrator), and creates beautiful work in numerous media. For this program, Gail will be showing us her stunning creations that give a whole new dimension to the art of pyrography. Lindsay Sandbothe, currently employed by the American Academy of Art, created quite a stir at the last few Nature Artists’ Guild exhibitions with her acrylic paintings of birds on wood. We can’t wait to get a glimpse of how Lindsay creates such breathtaking works. Please click on this link to Lindsay’s website to learn more about her and her artwork. This casual and fun presentation will take place at the Thornhill Education Center of The Morton Arboretum, Lisle, IL, on Thursday evening, August 6, 2015 from 7 until 9 pm, and is open to the public. Anyone interested in art or nature would certainly enjoy it! There is no fee for the program, for entry into the arboretum for this event, or for parking. Visitors should just let the gate attendant know that they are there for the Nature Artists’ Guild program, and they will be directed to Thornhill. ← Even the Vegetable Garden is Lovely!